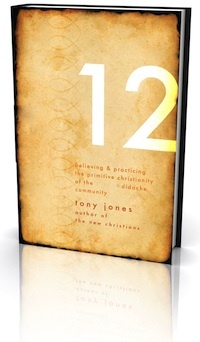 I’m happy to be a part of the blog tour for Tony Jones’s new book, The Teaching of the Twelve: Believing & Practicing the Primitive Christianity of the Ancient Didache Community. I have just a few comments on the first chapter, and you can also read some more comments on the first chapter by Thomas Turner of Everyday Liturgy (Tony shares some on the 1st chapter too here). What I think I found most interesting was when Tony points out the information about the dating of the Didache. As Tony mentioned above, while there is currently still some debate on the issue, it’s most likely written around the time of the Gospels and as Tony mentions in the book, “the Didache records a Christianity seemingly unfamiliar with the theology and writings of the Apostle Paul” (1). So many times when looking at Christian theology, some folks go straight to Paul (when I was in college, any theological question could be answered by someone going to Romans to see what Paul said). But what was it like to live in a pre-Pauline time? How did followers of the Way of Jesus make sense of their faith and their call to live in a kingdom way before Paul? Perhaps the Didache is one of the documents that can help give us a sense of what that kind of faith-filled life might have looked like. “…the Didache contains to mention of clergy or priesthood, nor does it grant bishops ecclesiastical authority, so it wouldn’t have been a very popular book for the burgeoning church hierarchy in the fourth and fifth centuries” (9). In an age where many are saying we need to get rid of the clergy-laity divide, or at the very least, rethink what that relationship looks like in a flattened world, it will be interesting to see how the Didache handles questions about leadership and authority in the church – or if it even does address any of those questions. I think it’s great that Tony has taken the time to look into this very important and little book. And I think it will be interesting to read the other persons’s thoughts who are on this blog tour of Tony Jones’s The Teaching of the Twelve. I hope you will pick up a copy for yourself (they make great stocking stuffers!) and join in the conversation. Adam, I look forward to hearing more. There as been alot of research recently, that is sketching an image of two streams of faith practice, that by James, and Paul. It is interesting that Paul’s christianity was started outside its origins. That Paul likely had no contact with the disciples until four years after his spiritual experience. It’s no secret James and Paul did not see eye to eye. That Acts wasn’t written until after both were dead, and whose authorship is still unclear might served as a document to merge the the two streams. Paul’s faith practice certainly applealed to a broader audience, and certainly caught the imagination of Rome. This may be the first incident where the megachurch swallowed up a small traditional church. Will these recent findings change things, likely not…but historically these findings are important if we are to truly understand the family story. And finally, the real kicker. How does Jones get off saying this text doesn’t mention authority figures in the church when it says this? “Appoint, then, for yourselves, bishops and deacons (ἐπισκόπους καὶ διακόνους) worthy of the Lord, men gentle and not money-loving and truthful and tested; for to you they likewise serve the unpaid public service of the prophet-teachers. Do not, then, look down upon them; for they themselves are your honored ones with the prophet-teachers” (15:1-2). “the Didache records a Christianity seemingly unfamiliar with the theology and writings of the Apostle Paul” (1). No wonder you love it. Let’s see…… is that the Paul who was taken to the third heaven, who conversed with Christ personally? The problem is YOUR christianity was started outside of both the Spirit and the Word. In the event that you’re joking: Funny! In the event that you’re not joking: Obviously this is a larger debate about Biblical inspiration and interpretation (if you believe in Biblical Inspiration a la James Gray’s The Fundamentals, then I should preface that we’re just going to fundamentally disagree), but is the fact that Paul conversed with Jesus supposed to give his writings more credibility? By that logic, Pontius Pilate, Judas, and, you know, the DEVIL (Luke 4:3) all hold equal credibility to that of Paul. Adam – interesting stuff. A group of us here in Divinity school were talking about the Didache the other day, and I brought up your post. Also, Adam: we’re still waiting for your Church is Alive video, good sir! Jack – well, Chris P. isn’t joking….we actually have a long history together on Pomomusings.com. You can just search for Chris P. (like here) and see a lot of his comments. Just as I’m sure he’d say the same about me, there isn’t much you say to argue with Chris and folks like him – unless you want to quote large chunks of scripture out of context. Glad you found this post interesting….did I tell you I was making a Church is Alive video? Shoot…well, I’ll have to get on that.